Please note, registrations for players under 16 years of age must be completed by a parent or guardian. Your Username and Password will be the same as they were when you set up your membership. If you cannot remember the password please select the ‘forgot password’ link. If you have forgotten your Username please contact registrations@britishamericanfootball.org or ask Amanda to check for you! DO NOT create a new profile. 2. Once logged into the BAFA system, click on ‘my profile’. 3. Please take this opportunity to ensure your profile details are up to date. Click the Update Details button to make any changes required. 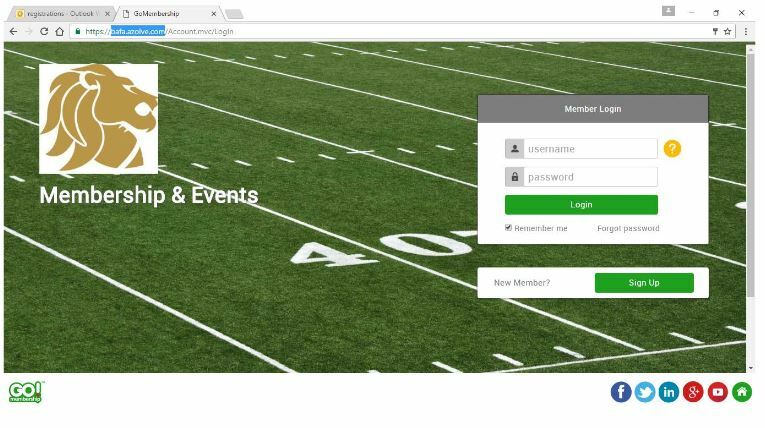 Once done, click on BAFA membership. 4. When you have done this, select ‘add’. Five options are now available to you. Contact and Flag are for players only. Then you have Coach, Other (for roles such as gameday manager, physiotherapist, statistician etc) and PlayerCoach (you will need to scroll over slightly for these options using the arrow icon). Select the appropriate option for the team you want to register for. Remember, if you play for one team and also coach with another, you MUST register as a player coach. 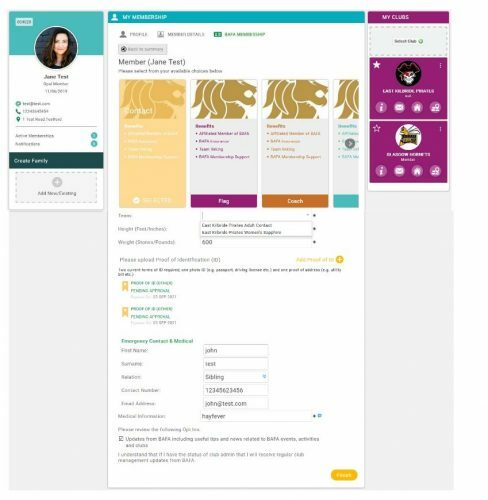 If you coach for multiple teams, then select your primary team when registering – Amanda will make sure you’re on all required rosters. A pending approval message will then appear on the screen if the item has been successfully uploaded. This can be ignored at this time – note, ID does NOT need to be approved for your to complete your registation. Members under 16 will also need to confirm parental consent. 6. Scroll down and select finish. You will then be taken to the payment page. Please check to see if all details are correct and that the correct fee, as per below, has been applied. 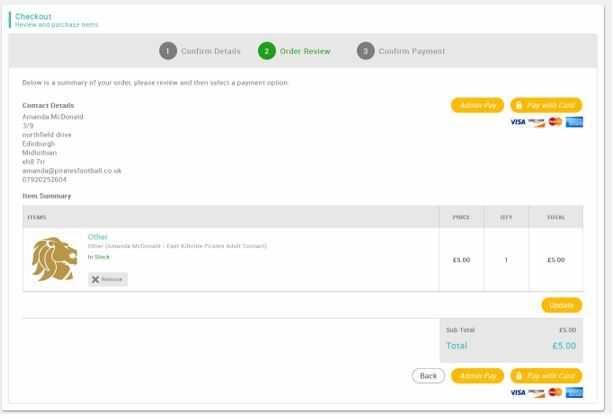 There will be an option to print your invoice confirmation once you have made your payment. You will also receive your confirmation via email. If you have any questions please do not hesitate to contact registrations on registrations@britishamericanfootball.org or Amanda at amanda@piratesfootball.co.uk or by text at 07920 252604.